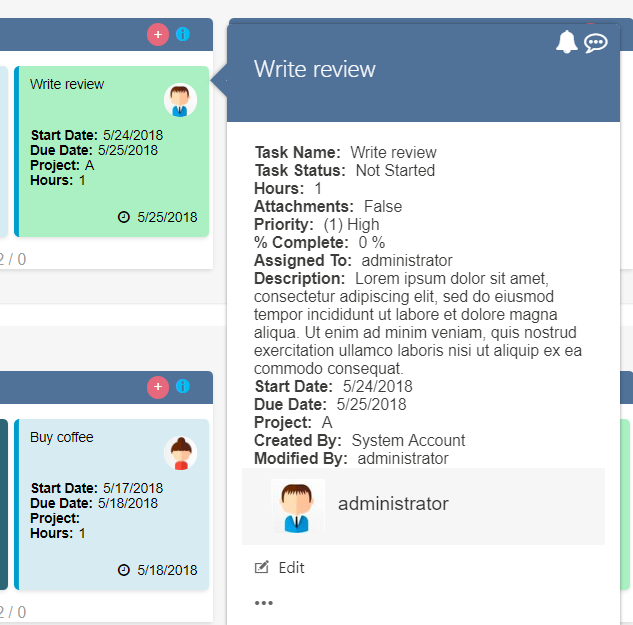 Virto SharePoint Kanban Board web part allows users to manage tasks placed in columns and rows according to their values. The “Hide empty swimlanes” button allows you to hide all swimlanes that do not contain any tasks at the moment. “Collapse all swimlanes” button can be used in case you have several swimlanes with tasks and you will close them to work with the one or with a few swimlanes only. To change the value of a task, drag and drop this task to the required column or row. Click on the item to view brief information about it in the tooltip. Click on bell icon in the right upper corner of task tooltip to assign task watchers. 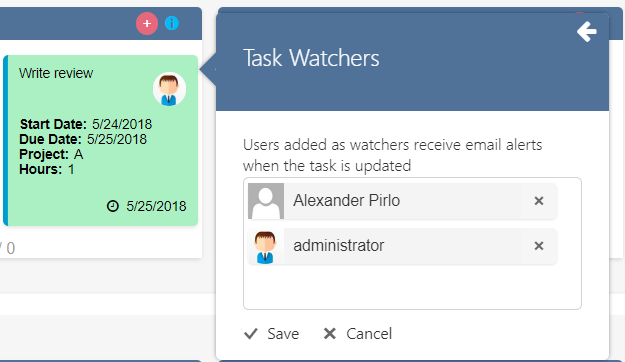 Task watchers receive email notification about any changes in this task. 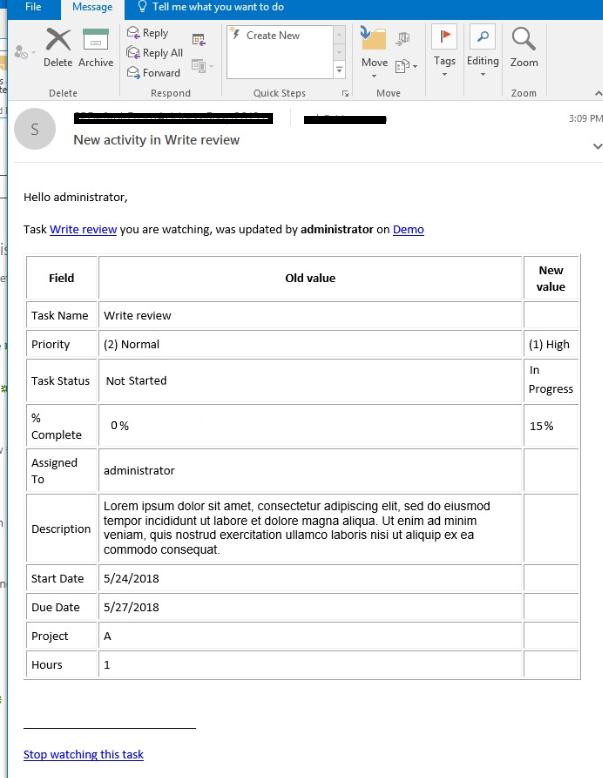 Task watchers receive email with a field changes tracking table. 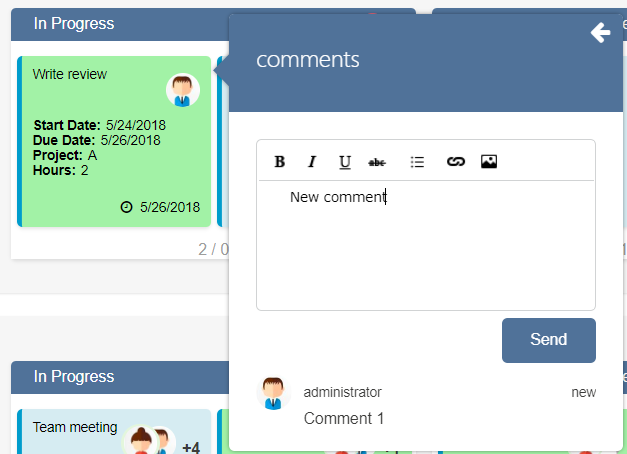 You and other users can add comments to tasks. To add a new comment, click comments icon on the tooltip and start typing. The comments history will be displayed as well. There are the following options: search control, sorting, and more specific condition filters. 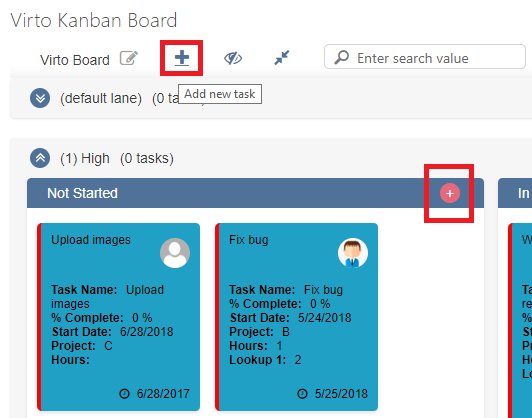 If you enable in Settings the tasks sorting according to a specified field, you may apply this filter on Kanban header. You may sort tasks in ascending and descending order. Note: if you set a field for sorting, the manual sorting of tasks in Views and Filters will be disabled. Click “Filters” icon in the right upper corner to open filters. You can use custom condition filters created in web part Settings (Advanced Setup) or create a new filter from the board view, using the edit button next to the Filters. 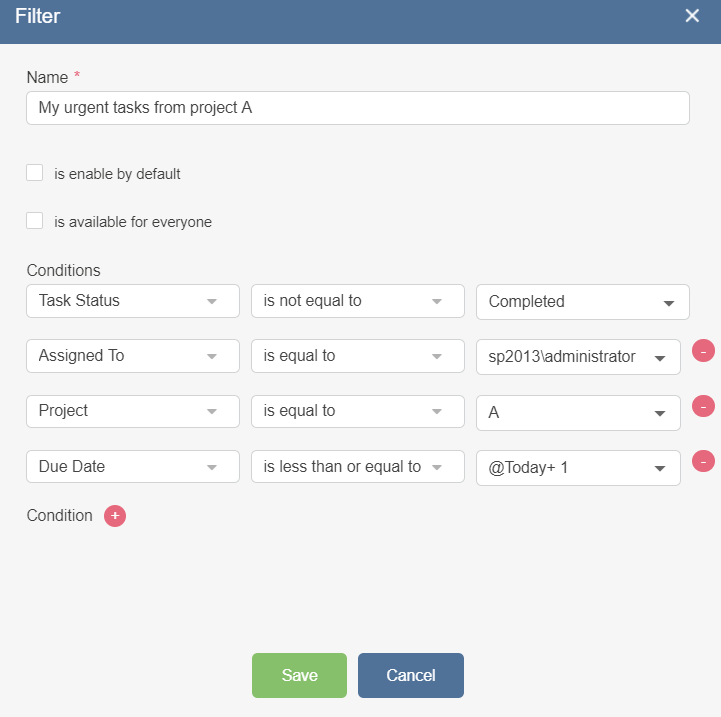 In the example below, “My urgent tasks from Project A” filter is applied. You can click on Edit icon and create new filters with “+” button. It is possible to enable a new filter by default. If you select “is available for everyone” checkbox, the filter will be visible for all users. If you do not enable this option, the filter will be saved as a personal filter. It will be available only for the user who created it. If you have several lists on this board, you can also use the Lists filter. 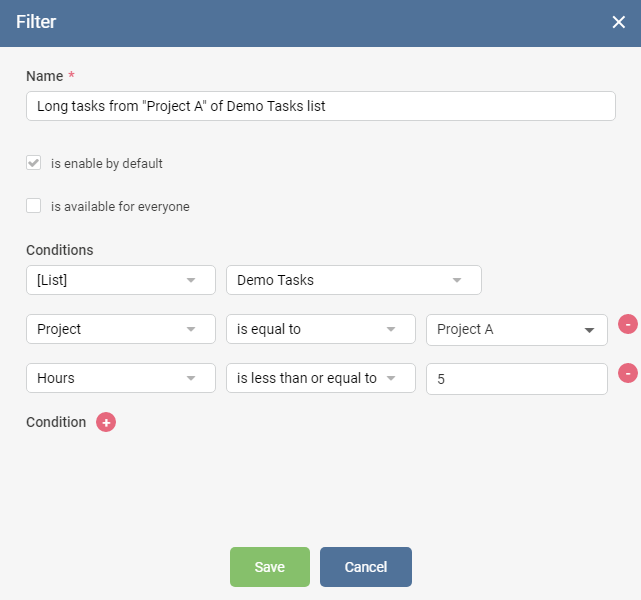 This filter allows you to sort tasks by the list they belong to and by additional conditions as well. In the following example, the tasks are sorted by 2 filters. 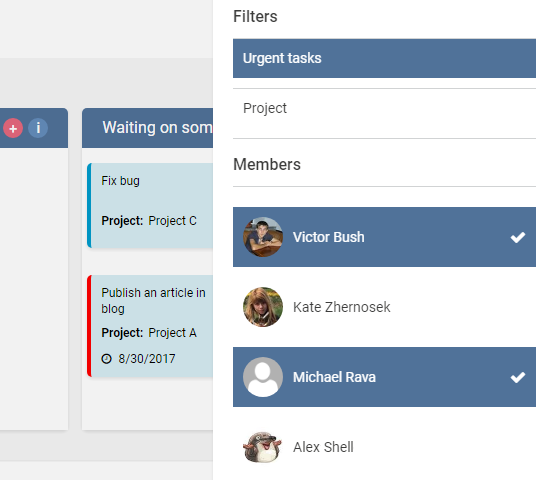 There are displayed all tasks from list “Kanban tasks 2” and all tasks from both lists from Project A. 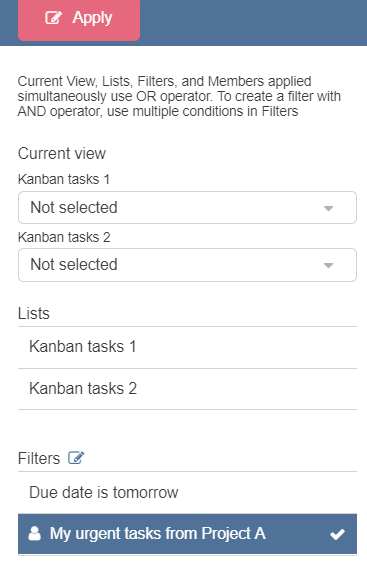 If you want to display tasks from Project A that belong to “Kanban tasks 2” list, you have to create one Filter with 2 conditions. Note: The filters selected from the menu use “OR condition”. If you have to create a filter with “AND condition”, you can use a complex filter containing several conditions. Use "Add new task" button to add an item to the board. Select a list where this task must belong to. The task creating form will appear. 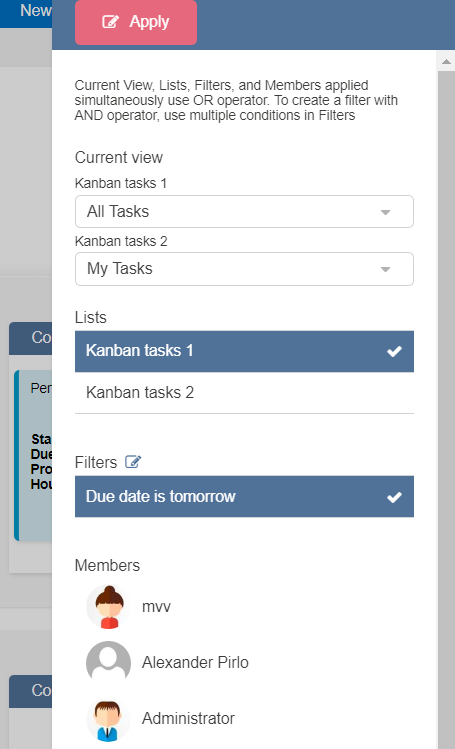 The fields for displaying on this form you can define in “Cards Setup” -> “Form” section of Kanban board. Another ability to add task is the button on column. Click “+” button and type a task name. The task will be placed in the task and row where you have clicked “Add” button. 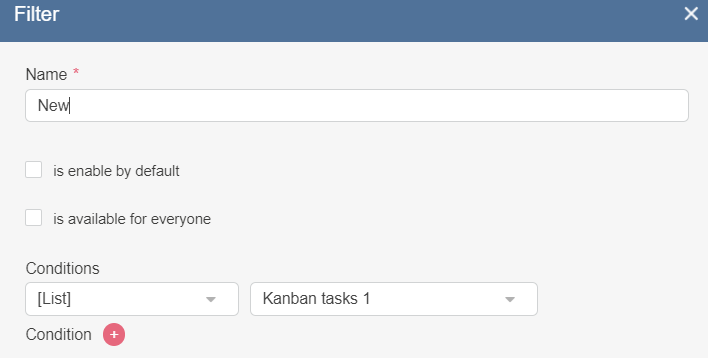 You can edit this task fields later from the standard Kanban task edit form. Click “Charts” icon in the right upper corner to open a chart view. 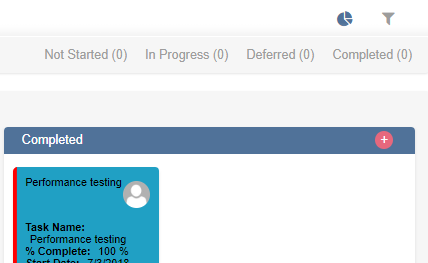 There you can see the tasks statistics with task statuses (columns) and assigned users. The charts are clickable, and you can show or hide certain values on this picture.